If you're in the market for the best SSD in 2019 that money can buy, the T3 experts are here to help: we've hand-picked the very best solid-state drives on the market, so you can pick one that you know is going to be reliable. The end is nigh for the traditional hard drive – with its propensity to fail too often and to run too slow – which means it's time to take the plunge on one of these super-fast SSD replacements. This new breed of drive offers fantastic stability, ever-increasing storage capacities and unrivalled speeds. There's a wealth of them to choose from for your desktop, laptop or games console... but which is the best SSD to buy in 2019? Here we've restricted ourselves to just the very best SSD drives on the market, covering a range of capacity options and models, so you should be able to find one to suit your budget. We've got options from the big players like Samsung and Crucial, as well as some from the lesser-known names too. If you're still not convinced about whether now is the time to pick up one of the best SSDs of 2019, check out some of the deals on offer: manufacturers continue to slash prices across the board, offering impressive capacities and performance at very decent prices too. When you've chosen the best SSD for your needs, check out our handy guide to fitting a solid-state drive into your laptop – it's not a difficult job and should take you less than ten minutes – or our great guide to installing a new SSD in a PS4, which is perfect if you fancy speeding up loading times on games as well as increasing your storage capacity. The last thing you want to do is buy an SSD and then have to upgrade it again in the near future – so aim for a solid-state drive with as much storage capacity as your wallet allows. When buying the best SSD for you, also check the physical specifications of the drive, to make sure your computer has enough physical room for it, and that the connections between the two are compatible. The majority of SSDs are 2.5-inch but there are 3.5-inch variants out there, and also pay attention to the z-height (the thickness). If you have a super-slim machine, fear not – you’ll just need to go for an M.2 type SSD. Lastly, quickly check your laptop is able to run via a Serial ATA (SATA) interface, before you buy a SSD. 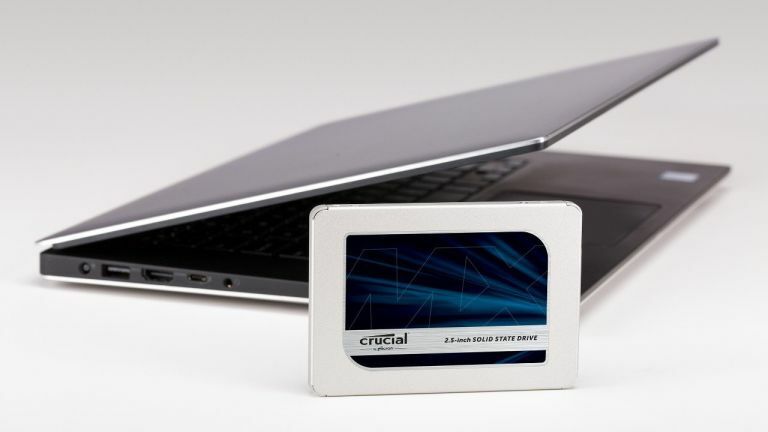 Crucial’s whopping 2TB SSD delivers sequential read/write speeds up to 560/510 MB/s and random read/write performance up to 95k/90k on all file types. It gets an added boost from Micron 3D NAND technology while there’s also 256-bit hardware-based encryption for better security. On top of that, you get the benefit of a brand with a proven track record. Samsung has upped its game in the SSD stakes with some new editions. This, the 860 EVO 1TB unit is super efficient delivering sequential write speeds up to 520MB/s thanks to Intelligent TurboWrite technology, and sequential read speeds up to 550MB/s. The superior performance means that it is ideally suited for the huge files that are so commonplace today, such as 4K video content, and it's easily one of the best SSD drives for 2019. This sizeable SSD from the Axiom camp comes with a slimline case that should fit the thinnest of laptops, and also features a temperature sensor for optimum performance. The other benefit of the latest SSDs is their light weight, with this example clocking in at just 63.5 grams. Data read/write speeds are 520 MB/s and 475 MB/s respectively. The UV500 SSD from trusted brand Kingston is available in available in multiple capacities from 120GB–1.92TB, so you can be sure of a size to suit your needs. This SSD uses a Marvell 88SS1074 controller and 3D NAND Flash, which provides great performance – this drive will certainly boost your systems responsiveness. With sequential read/write speeds of up to 500MB/s it'll make your digital life faster, without breaking the bank. We are also impressed with the end-to-end data protection and 5-year warranty. If you're after a workhorse of an SSD that you're going to be able to rely upon through several years (and probably several computers), the HP S700 Pro is absolutely worth a look as one of the best SSDs of 2019. The HyperX Savage solid-state drive oozes performance, and not just from its vibrant colour scheme: it's an easy pick for our best SSDs for 2019 list. The solid state drive boasts a quad-core, 8-channel Phison S10 controller that'll provide you with 560 MB/s read and 530 MB/s write speeds. Input/output operations per second figures for read/write are similarly impressive at 100k/89k, while its svelte form factor makes it an easy fit for most notebooks and laptops. WD makes storage you can rely on, and this premium SSD goes all out to maximise computing and gaming performance: with read speeds up to 3,470MB/s, an optional heatsink, and a choice of 250GB, 500GB, 1TB and 2TB capacities, it's absolutely worth considering as one of the best SSDs of 2019. It's particularly suited to custom PC gaming rigs. SanDisk really boosts its SSD offering with the Ultra 3D SSD, which should be of particular interest to gamers who'll appreciate the blazing speed and graphics – though it's a great all rounder too. It offers cool, quiet computing and proven shock and vibration resistance, while the advanced 3D NAND technology provides not only increased reliability but lower power usage too. When you need a new SSD that's sturdy, reliable and fast to boot, you come to Samsung. With the gargantuan 860 Evo 4TB (and the more modest 860 Evo 1TB), there's already a considerable choice when it comes to speedy storage solutions. The 970 Evo Plus is a powerful little thing, offering serious speeds without a price tag that's going to lay your bank balance to waste. Such a combination between performance and price is rare, and earns a spot in our best SSDs of 2019 shortlist. If you find yourself munching your way through storage and constantly looking for more then the latest Samsung 860 EVO SSD offers a substantial 4TB to keep you going. It's not that cheap, but gives you fast read and write speeds as well as included data migration and magician software. Add it all together and you've got a storage solution that is perfectly suited to professionals. Corsair have a solid background in storage and this, the ominous sounding Neutron XTi 960 GB, offers up performance aplenty with 560MB/s sequential read and 540MB/s sequential write speeds. Its lower power usage means the speed is matched by efficient performance. And, if you need something smaller then there are 240 and 480GB editions, as well as a stonking great 1920GB model at the top end of the spectrum.